With an estimated value of organic food sales of US$850 million, France ranked fourth in 2000 in Europe, behind Germany, the United Kingdom and Italy. Although France was a pioneer country in organic agriculture in the 1980s (see section 1 below), organic food sales grew at a comparatively low rate until the mid-1990s. For this reason, a large share of domestic organic production was exported to other European countries, in particular Germany. However, the organic market has expanded rapidly since the late 1990s. Many industry analysts believe the current high growth rate will continue in the next five years. In the 1980s France was a pioneer country in organic agriculture, accounting for 45 percent of total EC organic land. However, organic farming did not spread as fast as in other European countries in the 1990s. As a result, in 1999 France ranked fifth after Italy, Germany, Austria and Spain, with only nine percent of the EC organic acreage (Eurostat, 1999). Land farmed organically represented 371 000 ha in 2000, i.e. 1.3 percent of the total agricultural area, which is below the EC average. Between 1999 and 2000, organic acreage has risen by 17 percent, mainly driven by an increase in cereals and forage crops. According to the French Observatory on Organic Farming (ONAB, 2001), there were 9 283 organic farms, accounting for about 1.4 percent of all farms in 2000. Organic fruit and vegetables were cultivated on 27 945 ha (including vines and land in transition to organic agriculture) in 2000, accounting for 7.5 percent of total organically cultivated land. There are no official data on the volumes produced, but French production of organic fruit and vegetables is estimated by the author at some 70 000 tonnes for 1999. ONAB is currently carrying out a more detailed study to assess the volumes of each product. Over 2 100 farms grow organic vegetables. The main regions of production are Brittany and, to a lesser extent, the Rhone Valley and the Southwest. The principal products in terms of acreage are potatoes, cabbage, lentils, pumpkins, lettuce and artichokes (see Table 1). Over 2 200 farms grow organic fruit. The main production regions are the Rhone Valley, the Mediterranean rim and the Southwest. Normandy is important for its production of cider apples. The leading products in acreage are chestnuts, apples, plums, apricots, kiwifruit, almonds and cherries. Table 2 provides the breakdown of acreage by product. Source: Observatoire National de lAgriculture Biologique, 2000. The growth rate of areas cultivated in organic fruit and vegetables has increased in recent years (Table 3). However, growth is not as high as for some other organic product groups, such as cereals, and, depending on the year, is inferior or equal to the national average for all organic products. In particular, the growth rate of organic fruit output is relatively low. This is mainly due to technical constraints. No rotations are possible in orchards; thus, pest pressure is higher than in organic annual crops. The lack of adequate organic pesticides compounds this problem. However, the level of difficulty varies across products. Organic production is easier with kiwi, tree nuts and mirabelle plums than with pipfruit, such as apples and pears, or stone fruit like peaches (Du sol à la table, 2000). The current trend is for an increase of the area planted in kiwi, apricots, peaches, berries and tree nuts. Source: Observatoire National de lAgriculture Biologique, 2001. In 1997, the French Government launched a FF60 million action plan to develop organic farming (Plan pluriannuel de développement de lagriculture biologique). The Plan has the ambitious objective of increasing the number of organic farms to 25 000 and the area cultivated organically to 1 million ha (3 percent of the agricultural area) by 2005. In 1999 the Ministry of Agriculture doubled, and, in some cases, tripled, financial support to farmers who converted to organic production methods. Research on the production, marketing and consumption aspects of organic fruit and vegetables is also being developed in collaboration with the Ministry of Agriculture, National Institute for Agricultural Research (INRA), Interprofessional Office for Horticulture (ONIFLHOR) and Permanent Assembly of Chambers of Agriculture (APCA). More technical research is carried out by Technical Institute for Organic Agriculture (ITAB) and Technical Centre for Fruits and Vegetables (CTIFL). Total sales of organic food in France were estimated at FF6 billion in 1999 (INRA, 2000), which accounted for approximately 10 percent of total organic food sales in the European Community (EC). Preliminary estimates indicate that total organic sales could be close to FF7 billion in 2000. With a population of 60 million, the average per capita expenditure on organic foods was below the EC average of FF106 (Sylvander, 1999). Organic food accounts for less than 1 percent of the household food expenditure. From 1990 to 1997, sales grew on average by 12 percent annually (Sylvander, 1999), while in many other EC countries the growth rate was estimated at 25 percent over the 1991-96 period (Michelsen et al., 1999 and Lampkin, 1999). Fruits and vegetables accounted for 25 percent of retail sales in 1998 - the second largest segment of the organic market after cereals (Figure 1). As total organic retail sales stood at slightly over FF4 billion in 19981, retail sales of organic fruit and vegetables were therefore estimated at approximately FF1 billion. In view of the rapid growth in organic food sales, retail sales of organic fruit and vegetables in 1999 are estimated to range between FF1.1 and 1.2 billion. There are no official data on the quantities of organic fruit and vegetables produced, exported and imported, although the ONAB is planning a study on this topic. It is therefore difficult to provide an estimate of the total volume of organic fruit and vegetables sold on the French market. However, based on various industry sources, the volume of domestic production can be estimated at 70 000 tonnes for the year 1999. About half of it is directly marketed by farmers, while the other half is marketed by primary market operators (PMOs, operators who buy from French producers or foreign suppliers and sell to wholesalers or retailers). There were some 70 PMOs in 2000 (LEcho, 2000). Most of them have been involved in the organic sector for a long time. A few are mainstream conventional fruit and vegetable operators who have diversified into organic fruit and vegetables. The combined volumes sold by PMOs are estimated at some 60 000 tonnes for 1999 (calculation based on the volumes declared by each PMO; see Rivry, 2000; Du sol à la table 2000). A substantial share (estimated at 30 to 35 percent) of the organic fruit and vegetables produced in France is exported to the United Kingdom, Scandinavia, Germany and Switzerland, where prices are reportedly more remunerative than in the domestic market. This trade pattern has existed since the origin of organic farming in France. However, the share of exported production has recently fallen, as domestic consumption has been expanding. Currently, French exports can be estimated at approximately 22 000 tonnes on the basis of exports indicated by PMOs. 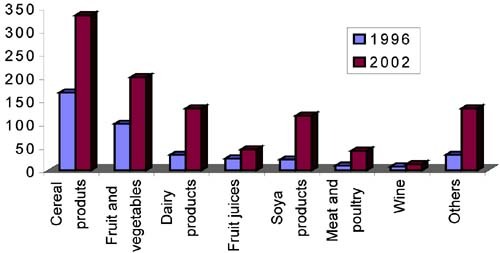 Imports of organic fruit and vegetables were estimated at some 25 000 tonnes in 1999, based on the survey of the major French importers (see section 3 below). The volume sold on the French market is equal to domestic production, plus imports, minus exports, which gives an estimate of 73 000 tonnes. Figure 2 summarizes the flows of organic fruit and vegetables in the French market. The number of specialized natural food stores was estimated at 1 500 in 2000. One-third of these stores belong to retail chains. Biocoop, La Vie Claire and Rayons Verts have a national coverage, while chains, such as Satoriz, Naturalia, Croqnature, Dame Nature, La Vie Saine and Eau Vive have a regional coverage. Organic foods were primarily sold in specialized stores until the early 1990s. Since then, however, supermarkets have been increasingly involved in the marketing of these products and have become the leading retail outlet (Figure 3). Retail companies, such as Monoprix, Carrefour, Auchan and, more recently, Leclerc, now carry organic foods. It is estimated that at the end of 1999 large scale retailers accounted for almost half of total organic food sales (Sylvander, 1999). Natural food stores have responded by increasing the average size of their outlets, creating "organic supermarkets". With a number of organic supermarkets (over 200 square meters) estimated at 170 in 2000, France is the European leader. BioCoop had 190 shops in 2000, 100 of which larger than 200 square meters. Although conventional supermarkets have become prominent in the overall sales of organic foods, the situation is quite different in the specific case of organic fruit and vegetables. These are mainly produced by small-scale farmers who market their production either directly to consumers or through cooperatives or other forms of organization. As explained above, about half of the domestic production (35 000 tonnes) is directly sold by organic farmers. These direct sales (on the farm or in local markets) were estimated at approximately FF400 million in 1999. On the other hand, the combined turnover (including exports) of primary market operators (those who buy from producers and sell to wholesalers or retailers) was estimated between FF400 and 500 million (Biomag, 2000; Du sol à la table, 2000). At retail level, sales by specialized stores (organic or health foods shops) account for 32 percent of total sales. Biocoop now has 150 organic outlets in France. 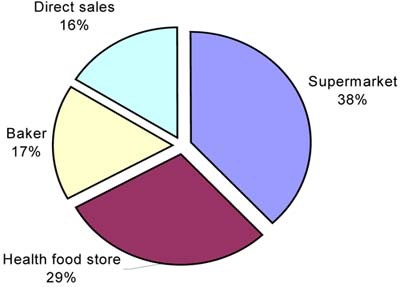 Sales by supermarket chains accounted from FF150 to 200 million, thus representing almost 20 percent of total sales (Figure 4). The involvement of large-scale retailers has remained limited thus far (see section 2.5 below). A weekly box scheme has been operating in France since 1998. Households subscribing to the scheme (called Le Campanier) receive a weekly basket of organic vegetables and/or fruit. The scheme covers Paris and its outskirts and distributes some 1 100 boxes weekly. The turnover for 2000 is estimated to range between FF3 and 4 million. The parent company is in the Netherlands (see the chapter on the Netherlands for an explanation on the concept). Consumption of organic foods has been rising steadily in recent years. The main buyers tend to belong in the categories of people aged over 65, middle-class households of 1 or 2 persons, and residents in large cities. A study (Benevise et al., 2000) shows that 73 percent of surveyed households know about the existence of organic foods. Among them, only nine percent regularly consume these products, while 31 percent sometimes do and 58 percent never. A later survey by the consumer magazine Que Choisir (2001) shows that 77 percent of respondents know the term organic agriculture and that 66 percent of them consider it as a sign of quality. Sales of organic fruit and vegetables are growing, although the growth rate is lower than for other categories of organic products. The fastest growing segments are to be found in processed foods. Foods based on milk, meat and soya, for example, are experiencing a strong increase in turnover. The market share of organic fruit and vegetables is comparable to the average market share of all organic foods in France and was estimated at 1 percent in 2000 (LEcho, 2000). However, there are differences across products. It seems that vegetables have a higher market share than fruits. For example, lettuce is reported to have a 1.9 percent share, which could be explained by the fact that pesticide residues cannot be eliminated at home by peeling unlike other vegetables. The average retail price for organic products in France for the period under study is 25 to 35 percent higher than for conventional products. While retail prices differ from one outlet to another, specialized organic food stores tend to price their items higher than supermarkets. Indeed, one report mentioned price differences of up to 50 percent in some cases between supermarkets and specialized shops for organic products in general (Piason, 1999). It seems that the price variations with conventional products are even wider for organic fruit and vegetables, which are highly perishable products. It is not rare to find a price difference of 100 percent between an organic fruit and the conventional equivalent. Due to the small supply base, the average price premium for organic fruit and vegetables can vary considerably from one week to another and across regions. The wide variations in prices can be partly explained by a lack of efficiency in the operation of the market, in particular due to the imperfect transmission of information. The Service des Nouvelles des Marchés (SNM) provides information on prices in southern France. Also available are weekly market analyses showing price during the previous week (http://www.snm.agriculture.gouv.fr). Full access to SNM services requires a paid subscription. The growth rate of the organic market in France - about 12 percent annually during most of the 1990s - has risen to some 20 percent annually for the past three years. Recent food safety problems, such as BSE, dioxin contamination and the uncertainty surrounding the safety of genetically modified foods have raised demand for organic products. According to a recent survey by Organic Monitor (2001), the organic vegetables market is forecast to grow by more than 30 percent per year. According to the authors calculations based on an industry survey, the combined turnover of organic fruit and vegetables at PMO level increased by 20 percent between 1999 and 2000. Bio Convergence has forecasted that the market for organic fruit and vegetables would double between 1996 and 2002, exceeding FF1.2 billion by 2002 (Figure 5). The future of the organic fruit and vegetable market in France will, to a large extent, depend on the attitude of supermarket chains. Although many of these products are currently sold in local open-air markets, future sales growth is expected to come mainly from supermarket chains. Indeed, they seem to be the only type of operators which have the financial, organizational and advertising power needed to develop a new market. So far, supermarket chains have taken different stances toward selling organics. Although most recognize that it is very positive for their image (carrying organic produce is said to convey the ideas of quality of life, food safety and respect for the environment), few have so far developed a wide range of organic products. This trend is even more marked for organic fruit and vegetables, which account on average for only 0.5 percent of organic food sales in supermarkets, far below animal products (see Table 4). It seems that the lack of supply, irregular deliveries, small-size suppliers and the perishable nature of organic produce has acted as a deterrent to many. Moreover, organic fruit and vegetables are usually sold packed in supermarkets in order to avoid confusion with conventional fruit and vegetables. This further raises their costs and creates problems to many organic producers who are not equipped with packing facilities. This non-aggressive attitude of large scale retailers has been an important constraint to the expansion of organic fruit and vegetables in France, unlike what has been occurring in other European countries (Denmark, Switzerland, Sweden and the United Kingdom), where supermarket chains drive the rapid growth in sales of organics. One notable exception is Monoprix, which strives to occupy the upper end of the market and has developed a range of organic products for more than ten years. The recent arrival of Carrefour, Europes largest retailer, in the organic market is also expected to boost sales. Until recently, the fact that demand for organic food was higher than supply inhibited operators from investing in promotion. However, the past two years witnessed a rise in promotional activities. One example is le printemps bio (organic Spring), a national, annual promotion week carried out by the organic industry from producers to distributors with the support of the Ministry of Agriculture. Consolidation of the French organic fruit and vegetables sector is expected as the market continues to grow. Mergers of suppliers and vertical integration are forecast. This should lead to economies of scale and closer links between supermarket chains and suppliers. Consequently, the marketing chain is expected to shorten, leading to more efficient distribution and lower retail prices. Several significant constraints must be addressed if organic fruit and vegetable sales are to reach a substantial share of the market. First, the high prices of these products remain a major deterrent for consumers. Most consumers accept to pay a maximum difference of 30 to 35 percent over the price of conventional fruit and vegetables (Hortirève, 1997). As seen in the previous section, the price difference is often greater than this maximum. A second important constraint is the lack of information on the products and organic farming in general. Although more information on this topic has been available recently (through the general press and the media), the share of French consumers who do not know precisely what the concept of organic agriculture covers has increased (Sylvander, 1998). Third, some consumers believe that there are no differences between organic and conventional products, or at least that it is not worth paying a higher price for the small difference that might exist between the two products. A fourth important issue is the existence of doubts as to the integrity of organic products. A substantial number of French consumers seem to think that the system of control and certification is not totally reliable and that some conventional products may be sold under an organic label. The distrust is higher for imported organic fruit and vegetables than for those that are produced domestically, which can potentially pose a problem to supplying countries. Finally, the lack of availability of organic fruit and vegetables in mainstream shops does not encourage consumption. The French organic horticultural sector is fragmented, and the quantities supplied by market operators are small. As a result, it has been difficult for supermarket chains to forge strong relationships with suppliers, thus discouraging the large-scale retail sector from getting significantly involved in organic fruit and vegetables. Organic fruit and vegetables entering France are subject to the same basic requirements on quality, labelling, sanitary and phytosanitary characteristics as conventional fruit and vegetables. In addition, the importer must be able to demonstrate that the products have been produced and handled in accordance with the recognized EC standards. Organic production, labelling, certification and imports in France are governed by the EC 2092/91 Regulation. Organic products produced in France must be certified by a certification agency accredited by the Ministry of Agriculture. At the time of writing, there were five accredited agencies in France (Ecocert, Qualité France, Ascert International, Qualité Nord Pas de Calais and Usale), but this may change over time. Interested producers and exporters should consult the French Ministry of Agriculture to obtain an updated list of accredited certification bodies. Certified products can carry the Agriculture Biologique (AB) logo issued by the Ministry of Agriculture. The logo shows that importers and distributors are registered with an organic certification body of an EC member state. It is meant to give French consumers clear assurance that the product is genuinely organic. Organic products from EC countries must be certified by a certification body which is officially accredited by the relevant authority in its country of origin. For organic products sourced from countries outside the EC and not on the EC Article 11 list (see Chapter 1, Regulation in the EC) an import certificate is needed. Importers wishing to import organic fruit and vegetables from these countries have to provide the Ministry or one of the above certification bodies with detailed evidence of the equivalence of production rules and effectiveness of control in the country of origin. The French certification body studies the application file and give its opinion to the Ministry for decision. There are some 15 importers of organic fruit and vegetables in France, some of which import only small quantities (a few hundred tonnes per year) on an irregular basis. Most, however, also buy domestic products. Many importers are located in the Southeast (Perpignan, Cavaillon), a horticultural production area, or in the Rungis wholesale market near Paris, where many fresh produce importers are based (Annex I). The two largest importers are Bioprim and Pronatura in the Southeast. Many importers also have other functions, such as wholesaler or distributor. Many re-export to other EC countries (e.g. BioDynamis, BioPrim, ProNatura). Some importers are organic producers (or cooperatives) who have decided to develop importing in order to better respond to their clients needs for regular year-round supplies (e.g. AgroBioDrom, FRDP). Some producers have formed associations or joint-ventures across borders, as in the case of Uni-vert (French and Spanish producers) and Imago (Spanish and Moroccan producers). Conversely, some importers have taken over organic farms to secure regular supplies. For example, ProNatura has bought organic farms in Brittany and Morocco, while Exodom has decided to invest in production in Cameroon. According to the USDA, total imports of organic foods into France in 1998 were valued at FF300 million and averaged 30 000 tonnes (Zygmont, 2000). Total imports account for about 10 percent of the organic food market in value. Some 40 percent of imports in volume come from the so-called "third countries" (i.e. non-EC countries). Frances trade balance is in deficit for most organic plant products, including fruit and vegetables. There are no official figures of total imports of organic fruit and vegetables, as customs offices do not distinguish organic and conventional products2. According to industry estimates, imports account for approximately one third of the organic fruit and vegetables sold in France. A recent survey estimates that this share could even reach 50 percent in 2001 (World Organic News, 2001). The Ministry of Agriculture (Direction de la Production et des Echanges Internationaux) has calculated figures based on importer requests for import certificates from third countries. However, these figures are not very accurate, as they are only forecasts of imports, and do not correspond to actual imports. Moreover, the data is not sufficient to evaluate the total volume of imports, since it ignores both EC suppliers and the six third countries on the Article 11 list, some of which are important suppliers of organic fruit and vegetables. A large share of imports comes from the EC. Even tropical fruits, which are chiefly produced outside the EC, may be imported into the Netherlands or Belgium and re-exported to France. It is therefore indispensable to carry out direct surveys of the French importers to have a more precise idea of French imports of organic fruit and vegetables. FAO conducted a survey of the 15 French importers of organic fruit and vegetables, using questionnaires. The survey had two main goals: to evaluate current imports of organic fruit and vegetables, and to assess the prospects for market growth in the next three years. Although the rate of reply to the questionnaire was relatively low, phone and direct interviews generated the information sought from all importers but two. Importers were asked about the origins and volumes for each product category. The detailed figures by product are presented in Tables 5 and 6. Some 1 000 tonnes of products were of unspecified nature (i.e. no differentiation between fruit and vegetables). When this amount is added to the totals of Tables 5 and 6, a figure of 23 000 tonnes is obtained. Allowing for small quantities that were not mentioned by importers and a few importers who did not reply to the survey, a total of 24 000 to 25 000 tonnes can be considered a reasonable estimate of French gross imports of organic fruit and vegetables in 1999. These imports would account for about one third of the organic fruit and vegetables sold in France. However, the existence of significant re-exports means that the actual share of imported produce is lower. This figure of 25 000 tonnes is very low when compared to gross imports of fruit and vegetables which stood at over 3.6 million tonnes in the same year. Imports of organic fruit are greater than those of organic vegetables. Citrus account for more than half of organic fruit imports. Tropical fruit (pineapple, banana, mango, avocado, passion fruit, papaya and litchi) account for 15 percent of imports. The most imported temperate fruits are apples, followed by grapes, peaches and nectarines. The most imported vegetables are tomato, broccoli, carrot, courgette and pepper. A table with more details on the countries of origin is provided in Annex III. Source: FAO survey of importers (2000) (*):Australia, Argentina, Hungary, Israel and Switzerland. From 1993 to 1998, French imports of organic foods rose by 20 percent annually. The survey indicated that the growth of organic fruit and vegetable imports in 2000 was some 30 percent. This figure confirms that after a long period of slow growth, the French market has started to pick up and growth is now closer to the trend observed in northern European countries. Importers were also asked what were the products that had the fastest growth in sales and for which demand was likely to continue to grow in the next two or three years. Among tropical fruits, banana and mango were growing relatively fast. The same was true for oranges. However, importers warned that there was already an abundant supply of organic citrus and that the market was about to be in a surplus situation. In the case of bananas, while demand continues to be strong, it seems that it increases less rapidly than supply. Production of organic bananas has been growing rapidly in the Dominican Republic, Colombia, Ecuador, Mexico and other tropical countries. Consequently, prices for organic bananas have decreased significantly since the end of 1999. In temperate fruit, apple imports were growing fast in 2000. As for vegetables, the fastest growing product was carrots. According to importers, about two-thirds of French imports of organic fruit and vegetables come from EC countries (see Table 7). Spain accounts for half of the total quantity with almost 8 000 tonnes. Spanish exports are split evenly between fruit (mainly citrus and some stone fruit) and vegetables (courgettes, peppers, tomatoes). Italy is Frances second largest supplier and mainly supplies fruit (citrus and apples). Together with Spain, it accounts for 87 percent of French imports from the EC. The third EC supplier of France is the Netherlands (mainly vegetables), but imports are far smaller than those from Spain and Italy. Source: FAO survey of importers (2000). (*): the Moroccan export control authority declared about 2000 tonnes for 1999/2000. Oceania: New Zealand and Australia. Countries on the Article 11 list accounted for less than 10 percent of imports in 1999. The leading supplier of this group is Israel, with an estimated total of 1 500 tonnes (pomelo, avocado, carrot, potato, tomato). Argentina, the only developing country on this list, ranked second and supplied some 700 tonnes of citrus (oranges) and vegetables (onions) in 1999. Third countries which are not on the Article 11 list accounted for approximately 25 percent of French imports of organic fruit and vegetables in 1999. The leading supplier in this group is Morocco, which accounts for more than half of exports of this group. It supplies vegetables (mainly tomatoes, plus courgettes, peppers, cucumbers and green beans) and citrus fruit (from October to April). Far behind Morocco are Cameroon (pineapple, mangoes, papayas) and the Dominican Republic (bananas). Supplies from the Dominican Republic are underestimated, as some bananas are first imported into the Netherlands or Germany and then re-exported to France. This applies to imports from many third countries. Actual supplies of organic bananas can be estimated at over 1 000 tonnes. The other suppliers export much lower volumes. Among them are Tunisia (vegetables), South Africa (citrus in summer), the United States (apples), Guinea (tropical fruit), Madagascar (tropical fruit), Mexico (oranges), New Zealand (kiwi and apples in summer) and Egypt. There is a significant re-export trade in organic fruit and vegetables among European countries. France has long been a supplier of Germany, Switzerland and Scandinavian countries. It has exported a significant share of its production and also some products imported from countries with which it has historical trade links (Morocco, Tunisia and West African countries). For instance, Exodom imports from Cameroon and supplies Belgium. Imago imports from Morocco and re-exports to Belgium, Switzerland and Germany. Perpignan in southeastern France is an important hub for international trade in fruit and vegetables, including organic produce. It was not possible to assess the precise shares of re-export for each product, but the volume is high. Some importers declared that they re-export more than 60 percent of the volume marketed (even 80 percent in one case). The most re-exported products are citrus and vegetables from Spain, Italy and Morocco, and tropical fruit from sub-Saharan Africa (Cameroon, Guinea and Madagascar). Frances export market has evolved differently over the last four years. Demand has decelerated in Germany but has been growing strongly in the United Kingdom and in Scandinavian countries. Importers indicate that demand is greater than domestic supply for many products. Demand for organic fruit and vegetables in France has been growing rapidly. An annual growth rate of some 20 percent is expected over the next few years. Given the time required to convert to organic production (from two to three years), it seems that a significant share of the growing demand will be met by imports. However, there are a number of constraints to imports from third countries. Firstly, developing countries wishing to export citrus and temperate fruit and vegetables during the European production season are likely to face strong competition from other EC countries, in particular Spain and Italy. EC countries enjoy duty-free access to France as well as an EC-wide regulation on organic farming, which means that their organic products do not need to be certified twice from a legal point of view. (However, in practice, retailers often require a certification label from their own country.) Production has been growing rapidly in these countries, boosted by support from both national governments and the EC (including financial support during conversion), and it seems that they will soon have enough production in many products to meet demand. Secondly, many French consumers prefer locally-grown foods to imported ones. Organic traders therefore respect this preference and give priority to domestic products. The two largest French organic importers import products from all over the world. However, most of their suppliers are in neighbouring countries, even for a commodity like banana, which is often re-exported from European countries (in particular the Netherlands). When there are no French products available, importers try to buy from neighbouring countries, mainly Spain and Italy. Furthermore, a French magazine (LSA, 1999), echoed doubts about the integrity of imported organic products. The French cooperative association (Confédération française des coopératives agricoles) stated that without appropriate certification controls the term "organic" might be misused in developing countries. Thirdly, French traders wishing to import organic products from third countries which are not on the Article 11 list need to obtain a special certificate from the French authorities for each transaction. Although the procedure has been simplified, it can still take a long time (up to two months), which is too long for products that are highly seasonal and perishable. Fourthly, exporters have to be able to provide steady supply of high quality products. Most traders and retailers now consider that organic products must have a quality equivalent to that of conventional products. For those developing countries which have started organic farming only recently and lack the technical knowledge, exporting perishable organic products and meeting the high quality requirements of the importers is a considerable challenge. The regularity of supply is also a critical requirement of supermarket chains. Finally, it is very likely that in the long term some temperate products which are currently imported will be grown locally; this means that imports of these items would have to face increased competition from local production. The French Ministry of Agriculture has made it a priority to increase domestic organic production, in an effort to reduce France's dependence on imports. Total retail sales of organic fruit and vegetables in France were estimated to range from FF1.1 to 1.2 billion in 1999. The market has been growing steadily and is forecast to expand by some 20 percent annually for the next 2 years, exceeding FF1.5 billion in 2002. Despite this rapid growth, sales of organic fruit and vegetables still accounted for only one percent of total retail sales of fresh fruit and vegetables in 1999. A notable constraint to their market expansion has been the lack of involvement of large scale retailers, unlike what has been occurring in northern European countries, where supermarket chains drive the rapid growth in sales of organics. However, this could change with the recent arrival of Carrefour, Europes largest retailer, in the organic market. The involvement of conventional producers and market operators in organic agriculture is also set to increase supply. Most trade operators indicate that demand tends to be slightly higher than domestic supply, but that the gap can easily be met by imports, so there is no real shortage on the French market. Imports of organic fruit and vegetables are still low, albeit growing. They were estimated at approximately 25 000 tonnes in 1999, thus representing only 0.7 percent of French gross imports of fruit and vegetables. The main suppliers are European countries (mainly Spain and Italy) and, to a lesser extent, Mediterranean third countries (Morocco, Israel). Imports from other regions are presently low. Among developing countries, Morocco is the only country which exports significant volumes of organic fruit and vegetables to France. Its main exports are citrus and vegetables (tomatoes, courgettes, peppers). Morocco competes with Spain in the products and the supply period. The Dominican Republic exports organic bananas to France directly and indirectly through importers based in other EC countries. The other developing countries supply smaller quantities (from a few dozen tonnes to a few hundred tonnes annually, depending on the country) of tropical fruits (mangoes, papayas, pineapples, mainly from sub-Saharan Africa), off-season vegetables (tomatoes, courgettes, peppers) and citrus (from Argentina and South Africa). A substantial share of the imported products is re-exported towards northern Europe. Given the time required to convert to organic production (from two to three years), a significant share of the growing domestic demand for organic fruit and vegetables will have to be met by imports. Consequently, the French market offers opportunities to developing countries which can supply good-quality organic produce now and in the short to medium term. In the longer term, the products with the best opportunities are those which cannot be supplied in large quantities by other EC countries. Tropical fruits have a good market potential, as demand is currently much higher than supply. Several importers indicated a lack of good quality organic fruit, such as pineapples, mangoes, avocados, guavas and litchis. Suppliers must bear in mind that they will need to meet quality standards which are as high as those that apply to conventional products. Demand for organic bananas is also high, but potential exporters should pay attention to the rapid expansion of production in Latin America and the Caribbean. Organic citrus also offer interesting outlets, but mainly for off-season citrus. There is no shortage during the European production season due to the strong presence of Spain and Italy on the French market. Some importers fear that there might be a surplus of organic citrus in the coming years. Organic vegetables and temperate fruits seem to have a good market potential if produced and exported off-season, i.e., at the time of the year when European production is low. Therefore, they offer promising opportunities, primarily to countries in the Southern Hemisphere. Notwithstanding the real export opportunities, potential exporters should be aware that there are several important constraints. Organic traders tend to prefer buying domestically or from EC countries. This preference can be partly explained by consumer preferences and doubts about the authenticity of the organic claim for foods produced in countries where the system of organic certification and control is little known. Moreover, traders wishing to import organic products from third countries need to obtain a special certificate from the French authorities for each transaction. Although the procedure has been simplified, it can still take a long time (up to two months), which is too long for products that are highly seasonal and perishable. Some commentators view this process as a non-tariff barrier to trade. However, these constraints should ease as countries establish systems of organic certification that are recognized as equivalent to the European ones. Finally, the higher price of organic produce remains an important constraint, as in other European countries. There is much uncertainty surrounding the future of the price differential with conventional products. Over the last two years, prices for organic fruit and vegetables have remained stable in current value, which means slight erosion when inflation is taken into account. Most traders expect prices to decline to some extent as supply rises to meet demand and the organic distribution chain becomes more efficient through mergers and vertical integration. Some sources in the organic trade sector are concerned about the arrival of large conventional producers in the organic market. They warn that supply will suddenly surge when these producers complete conversion to organic farming. This surge could disrupt a market that is still very small, thus causing prices to fall. Other traders do not share these concerns and consider that demand will continue its strong rise, thereby keeping on a par with supply. Larger quantities of organic produce should give rise to economies of scale at both production and distribution level. As organic production tends to be more labour intensive than conventional production methods, there may be some longer term comparative advantage among developing country exporters who have certified organic products combined with relatively low labour costs. The price decrease is also expected to be caused by the improvement of organic production techniques, which should reduce production costs. However, it is difficult to say when this will happen, as it also depends on the rate of growth of demand. It is nevertheless probable that the price premium for organic fruit and vegetables will eventually be lower than the current level. Caution is therefore needed. Nonetheless, this expected price trend will not necessarily mean lower profits for organic producers, as higher sales volumes could potentially more than offset lower unit prices. Profits will ultimately depend on the relative variations of prices and quantities. Exporters of developing countries wishing to export organic fruit and vegetables to France should contact importers who are specialized in these products (see list in Annex). Specialized importers know both the administrative process and the technical requirements for handling imports of organic fruit and vegetables. Selling directly through specialized wholesalers or supermarket buyers may be difficult, as these networks are difficult to penetrate and are often not aware of the constraints faced by exporters in developing countries. Fax: +33 1 46 15 70 69. Fax: +33 4 75 85 62 12. 75 611 PARIS cedex 12. 1 A report by USDA (Zygmont, 2000) indicates that sales of organic foods are expected to reach US$1.25 billion (over FF8 billion) in 2000, but this figure seems overestimated. 2 The European Commission has recently approved a regulation which will require Member States to record the quantities of organic products entering the countries. However, this system is not expected to be implemented before 2002, at the earliest.